The Philadelphia Eagles may have been playing coy about having Nate Allen and Kurt Coleman as the team’s starting safeties going into next season, as in a moderately surprising move, Philly snagged up veteran free agent safety OJ Atogwe. 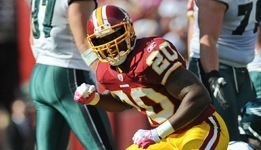 Atogwe, who is well known for signing a massive five-year deal in Washington last off-season, was released by the Redskins earlier this year. His release comes in the wake of a mediocre (to put it lightly) season that was dampened with a series of injuries that only allowed him to play in eight games. However, before going to Washington, Atogwe was a borderline Pro-Bowl talent for the St. Louis Rams. Last season may not have been a good gauge of what a once prominent defender has become. He is 31, and he was still a free agent — so don’t get too excited. Ideally, Atogwe could come in and bolster either safety position in Philadelphia by adding depth. Both Coleman and Allen had more struggles than triumphs in 2011, and chances are one of them will be replaced by the end of the season, and Atogwe would be a good guy to have backing them up. This isn’t a signing on caliber with what happened last off-season, but Atogwe could still be a valuable addition to Philadelphia’s defense if the right situation arises. And if not, he’s still an incredibly low-risk player and wont sway the team in either direction. The real question is — why not sign OJ?